Bacon Blitz is a mortar-shooting action strategy defense game where you take control of the green pork army. In this game, the enemies have started their invasion and are sending wave after waves of enemies. Your goal is to defend your camp for as long as you can by raining mortar shells from the sky. In this game, you have two soldiers who automatically fire with their gun, a commander that can call in powerful reinforcement, and you – a mortar carrying pig. Earn coins to unlock weapons and upgrade your units! Have fun! Ready your pork army and defend your base against the pork invaders in this awesome action strategy defense game – Bacon Blitz! Aim the mortar, order your solders, and call in a nuclear strike in this cute yet challenging game. 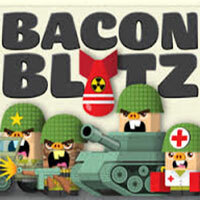 Bacon Blitz is a free online strategy game on Round Games.